Picking up with Louiesa’s story from Memoirs of a Play-White, Helene Louiesa Mynhardt’s second memoir is just as intriguing a story as her first. 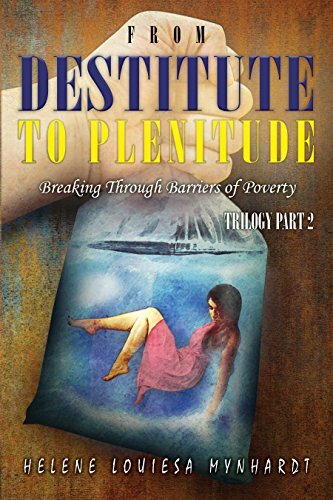 From Destitute to Plenitude takes the reader further into the personal and professional life of Louiesa as she continues to transverse a world in which skin color is still a major player. This memoir begins with an in-depth look into the history behind South Africa’s classification laws and how they affected everything from politics to sports to how families were divided. The memoir then picks back up with Louiesa’s story to show how she personally has lived through South Africa’s troubling climate. The reader moves through the years with Louiesa as she creates a lucrative job opportunity for herself, despite roadblocks and hardships brought on by her heritage; as well as follows her marriage and the lives of her children and family. Once again the reader gets a through-the-lens look at real life in a country where equal rights and equal opportunities are still not prevalent. I like how this memoir, as with the author’s first, is told in a third person account, allowing the reader to make up their own mind concerning details and events. The author also does a nice job of weaving history and current or related factual information throughout the telling of the memoir to give credence to what is occurring and why. This makes the memoir more personalized for those readers who are not familiar with life and politics in South Africa. Adult readers who enjoy memoirs, current events, and culture would enjoy this book.